Steel frame construction has evolved to become a modern marvel of structural stability and design possibilities. A large number of structures today rely on steel construction, comprised of thousands of tasks and materials that all need to work in tandem to create the best outcome for your design specifications. Studies have shown that the structural collapses during construction is one of the most dangerous aspects of the job. Today, additional reinforcement measures are required to keep your structure safe and sound while it goes vertical. It can prove beneficial to find a steel company to help you find the best solutions for your design demands through this process. If you are looking for experienced steel fabricators and erectors in Michigan, Sanilac Steel is here and ready to help. Since 1967, our steel erection team has worked to develop the safest and most efficient outcomes for each and every client. From ornamental metal work and stairways to commercial steel construction services, our contractors are here to make a difference on your site. 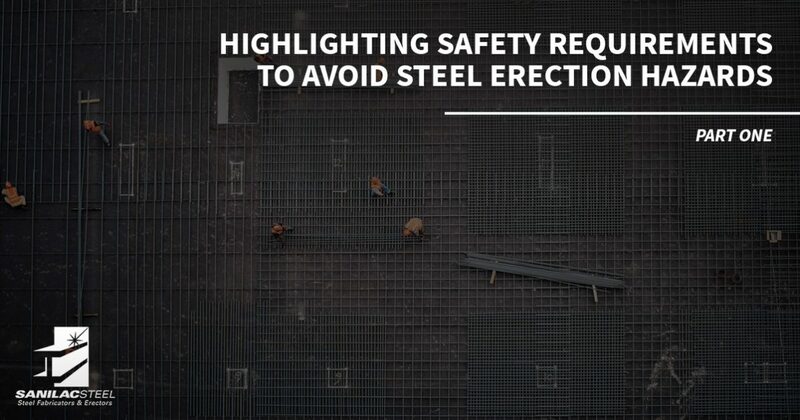 Continue reading to catch up on a few safety measures you may not have known about in regards to steel erection. Be sure to contact us when you are finished to learn more about our complete steel fabrication and installation services! One of the most vital parts in securing your frame during steel erection services is the use of guy cables or plumb cables to keep every component stable. OSHA standards mandate that plumbing-up tools and materials will be required during structural steel erection to keep everything in place. The guying features should remain in place until other reinforcing measures have been implemented to constitute a safe replacement. Removing cables before it is safe can result in a number of hazards, making it essential for you to invest in a team with a history of success. Sanilac Steel has the experience and safety record to back up our steel erection processes. Our contractors communicate effectively at all stages of our steel construction to ensure a safe and accurate outcome. We understand the relationship between structural forms and guying systems, working with you to develop a process that is both safe and effective for every team involved. When dealing with large columns, it is important to focus on structural safety! A sound bracing system will do much to enhance the safety of your site. Bracing your framework helps to provide stability for forms under heavy duress, including builds, multiple crewmembers, repairs, slab installations, and more. When done correctly, bracing can prove to be a safe, effective, and affordable solution for your structure. By relying on key connections at vital structural points, your building can resist movement and support heavier loads common during the construction process. Cross bracing is one method that relies on intersecting supports to provide diagonal support. Buildings in areas that experience high levels of seismic activity can benefit from this cross-braced support. Our steel construction team is here to provide quality bracing solutions for your structure. We have a record for successful outcomes, working with inspectors to achieve high-strength results. We have experience on jobs of all sizes, and will work hard to deliver the best results on-time and on-budget. This element of steel frame construction is one of the most common connections used in construction. Pre-engineered and custom buildings alike require precision in terms of location and strength for bolt applications. The pre-treatments and tension used during the bolting process will also play a role in the long-term performance of your structure. Bolts and welds have the higher potential for failure when compared to the beams used, making it vital to employ a team with the experience and training needed to get the job done right. Sanilac Steel can work with you to create fast, durable, and efficient outcomes for all of your bolting applications. Our steel construction experts take pride in creating results that are both safe and affordable. Be sure to check back next time, when we conclude our two-part series concerning safety measures in steel reinforcement. If you’re in need of a team to provide a quality outcome for your project, be sure to contact our steel erectors in Michigan for a quote!